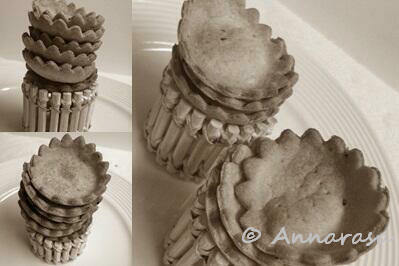 For the Daring Cooks April 2011 Challenge, I made some edible containers well suited to Indian-style savoury canapes. Inspired by Chaat-Papdi, Dahi-Puri, and Raj Kachoris, I made a hybrid savoury container that can hold all your favourite chaat fillings! And its not deep fried!! Indeed, instead of frying, I baked these delicious cups in the oven to get a crisp biscuity finish that is perfect in both taste and crunch. Combine the all-purpose flour, semolina, salt, nigella seeds, turmeric, and red chili powder. Sift together until all ingredients are well blended. Rub the butter into the flour mix until it resembles breadcrumbs. Pour in the yogurt and just enough water to get a medium-soft dough. Set aside for half an hour. Roll out the dough ti about 1/8" thickness. Using a cookie cutter of choice, cut out circles that will fit you choice of muffin pan. Lay neatly one cutout per pan. Bake in a 350F oven for 12-15 minutes until crisp and golden. Store in an airtight container or use as required. The canapes taste so yummy by themselves that I just munched a few before they could even cool down. Try these bite-sized wonders with any spicy, tangy, savoury filling of your choice. Blog-checking lines: Renata of Testado, Provado & Aprovado! was our Daring Cooks’ April 2011 hostess. Renata challenged us to think “outside the plate” and create our own edible containers! Prizes are being awarded to the most creative edible container and filling, so vote on your favorite from April 17th to May 16th at http://thedaringkitchen.com! Click here for the complete April 2011 Daring Cooks Challenge! 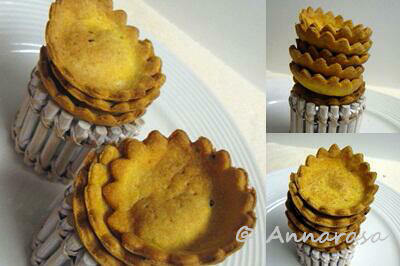 Those savoury canape cups looks fabulous, prefect to serve with some interesting fillings..